2004-06-12 Application filed by 야후! 인크. filed Critical 야후! 인크. 하나 이상의 포맷으로 이벤트 기반 피드 또는 시간 기반 피드로서 수신될 수 있는 콘텐츠에 기초하여 알림 메시지를 제공하기 위한 아키텍처가 개시되어 있다. Has an architecture for providing a notification message is described by one or more format based on the content that may be received as an event-based feed or time-based feed. 이 아키텍처는 상기 콘텐츠를 미리 정해진 데이터 구조로 정규화하고, 선택된 특징들에 따라서 상기 콘텐츠를 인덱싱하여 다량의 콘텐츠를 처리하기 위한 데이터 수집 처리 모듈(103)을 포함한다. The architecture includes a data acquisition process module 103 for processing a large amount of content, the content indexing in accordance with the normalized, and selected characteristics of the content to the predetermined data structure. 매칭 엔진(110)은 사용자 쿼리들을 이용하여, 상기 이벤트 기반 콘텐츠를 선택된 콘텐츠와 관련된 알림 메시지들을 수신하는 것에 관심을 표시한 하나 이상의 사용자들과 관련시킨다. Thereby matching engine 110 is associated with the user query, and said event-based content to one or more indicated an interest in receiving notification messages related to the selected content the user. 이 매칭 엔진은 또한 대응하는 알림 메시지들을 발생시킨다. The matching engine also generates a corresponding notification message. 폴러(120)는 사용자들을 대신해서 소정의 주기로 콘텐츠를 페치하고 대응하는 알림 메시지를 발생시킨다. Poller 120 generates a notification message on behalf of the user to fetch a content in a predetermined cycle and respond. 전달 인터페이스(130)는 어느 알림 메시지들이 즉시 송신되어야 할지 그리고 어느 알림 메시지들이 나중의 전달을 위해 스케줄되어야 할지를 판정한다. Transmission interface 130 determines whether any notification messages to be sent immediately, and which notification message to whether to be scheduled for delivery later. 이 아키텍처는 범위성(scalability) 및 백업을 위하여 미러링된다(158). This architecture is mirrored for scalability (scalability) and backup (158). 본 특허 출원은 2003년 6월 13일에 출원된 미국 가출원 번호 60/478,401의 우선권을 주장하며, 이에 35 USC 119(e)의 규정에 따라 상기 최초 출원일의 이익을 주장하는 바이다. This patent application claims the benefit of further declare that the first filing date in accordance with the provisions of the United States claims the priority of Provisional Application No. 60 / 478,401, and this 35 USC 119 (e), filed on June 13, 2003. 본 발명은 일반적으로 메시징에 관한 것으로, 보다 구체적으로는, 네트워크를 통한 알림의 전달을 가능케 하는 것에 관한 것이다. The present invention relates generally to messaging and, more particularly, relates to enabling a transmission of a notification from the network. 일부 서비스들이 주식 시세(stock quotes)와 같은 전문화된 콘텐츠(specialized content)에 대한 알림을 사용자들에게 제공해왔다. Some services have been provided to the user notified of the specialized content such as stock quotes (stock quotes) (specialized content). 이들 알림 서비스들은 일반적으로 특정 서비스에 등록된 사용자들에게 단일 주제(single topic)에 대한 콘텐츠를 제공한다. These alerts are typically registered for the service to a particular user providing content on a single topic (single topic). 다수의 주제에 대한 알림을 얻기 위하여, 사용자는 일반적으로 다수의 서비스들에 등록한다. To get notified about a number of topics, users are generally registered a number of services. 도 1은 본 발명에 따른 모범적인 알림 아키텍처를 예시한다. Figure 1 illustrates an exemplary notification architecture in accordance with the present invention. 도 2는 도 1과 관련하여 설명된 아키텍처에 대응하는 기능 엘리먼트들 간의 관계 및 데이터 흐름을 예시하는 기능 블록도이다. 2 is a functional block diagram illustrating the relationship and data flow between the functional elements corresponding to the architecture described in conjunction with FIG. 도 3은 수집된 콘텐츠를 처리하기 위한 모범적인 논리를 예시하는 흐름도이다. Figure 3 is a flow chart illustrating an exemplary logic for processing the collected content. 도 4는 스케줄된 알림(scheduled alerts)을 생성하기 위해 폴링된 콘텐츠(polled content)를 관리하기 위한 폴러 아키텍처(poller architecture)를 예시한다. 4 illustrates the polar architecture (architecture poller) for managing the polling schedule to produce a notification (scheduled alerts) the content (content polled). 도 5는 시간 기반 알림을 준비하기 위한 논리를 예시하는 흐름도이다. Figure 5 is a flow diagram illustrating the logic for preparing a time-based notifications. 도 6은 1인 이상의 사용자에게 알림을 전달하기 위한 모범적인 논리를 예시하는 흐름도이다. Figure 6 is a flow chart illustrating an exemplary logic for transmitting a notification to one or more users. 도 7은 본 발명의 일 실시예에 따른 모범적인 서버의 기능 블록도를 도시한다. Figure 7 illustrates a functional block diagram of an exemplary server, according to one embodiment of the present invention. 이하에서, 본 명세서의 일부를 형성하고 본 발명이 실시될 수 있는 특정한 모범적인 실시예들을 예시적으로 도시하는 첨부 도면을 참조하여 본 발명을 보다 상세히 설명한다. In the following, with reference to the accompanying drawings which illustrate specific exemplary embodiments in which the present and form a part hereof invention may be practiced by way of example and will be described in the present invention in more detail. 그러나, 이 발명은 여러 다른 형태로 구현될 수 있으므로 여기에서 제시된 실시예들에 제한되는 것으로 해석되어서는 안 되고, 오히려, 이들 실시예들은 이 개시 내용이 철저하고 완전하도록, 그리고 숙련된 당업자들에게 발명의 범위를 충분히 전달하도록 제공되어 있다. However, the invention should not be construed to be so can be implemented in many different forms limited to the embodiments shown here are, rather, these embodiments will become apparent to one, and the skilled in the art of this disclosure is to be thorough and complete, It is provided to fully convey the scope of the invention. 여럿 가운데서도 특히, 본 발명은 방법들 또는 장치들로서 구현될 수 있다. Among many Fig particularly, the present invention may be embodied as methods or devices. 따라서, 본 발명은 전적으로 하드웨어 실시예, 또는 전적으로 소프트웨어 실시예 또는 소프트웨어와 하드웨어 특징들을 결합한 실시예의 형태를 취할 수 있다. Accordingly, the present invention may take entirely hardware embodiment, an entirely or embodiments that combine software and hardware or software embodiments characterized in the form of examples. 그러므로, 이하의 상세한 설명은 제한적인 의미로 받아들여져서는 안 될 것이다. The following detailed description is, therefore, will not be taken in a limiting sense. 명세서 전반에 걸쳐서, "접속"(connected)이라는 용어는, 하등의 중간 매개 장치들 또는 컴포넌트들이 없이, 접속되어 있는 것들 간의 직접 접속을 의미한다. Throughout the specification, the term "connected" (connected) it is, without have some kind of intermediary devices or components, means a direct connection between the things that are connected. "결합"(coupled)이라는 용어는, 접속되어 있는 것들 간의 직접 접속, 또는 하나 이상의 수동 또는 능동 중간 매개 장치들 또는 컴포넌트들을 통한 간접 접속을 의미한다. "Bond" term (coupled); means a direct connection between the things that are connected, or one or more passive or active intermediary devices or indirectly connected with the components. 관사 "a", "an" 및 "the"의 의미는 복수의 참조들을 포함한다. The meaning of the articles "a", "an" and "the" include plural references. 전치사 "in"의 의미는 "in" 및 "on"을 포함한다. The meaning of the preposition "in" includes "in" and "on". 요약하면, 본 발명은 사용자가 관심사(interest)를 등록시킬 수 있게 하고 후속하여 그 등록된 관심사에 관하여 새로운 정보가 이용 가능하게 될 때 그 사용자에게 통지(알림)를 제공할 수 있게 하는 시스템 및 방법에 관한 것이다. In summary, the present invention provides a system and method for enabling a user can have to be able to register an interest (interest) and subsequently to provide at that time is about the registered interest new information becomes available notification to the users (alerts) relate to. 사용자가 관심을 가질 수 있는 콘텐츠 유형은 여러 가지가 있고, 그 콘텐츠 유형들은 주식(stock feeds), 뉴스 기사, 개인 광고(personal advertisements), 쇼핑 목록 가격, 이미지, 검색 결과 등을 포함하지만, 이들에 제한되는 것은 아니다. Users have the type of content that can be of interest to include many things, and that content types are stocks (stock feeds), news articles, personal ads (personal advertisements), shopping list, prices, images, results, etc., but these it is not limited. 또한, 알림은 각종의 전달 방법들 중의 임의의 방법 또는 모든 방법으로 사용자에게 전달될 수 있는데, 그 전달 방법들은 인스턴트 메시징(IM), 이메일, 단문 메시지 서비스(SMS), 멀티미디어 메시지 서비스(MMS), 음성 메시지 등을 포함하지만, 이들에 제한되는 것은 아니다. In addition, the notification may be delivered to the user in the delivery of various methods any way or all the way, the delivery methods are instant messaging (IM), email, short message service (SMS), multimedia message service (MMS), including a voice message but is not limited to these. 어떤 경우에, 사용자는 소정의 등록된 관심사들에 대한 알림들은 모든 이용 가능한 방법에 의해 제공되도록 선택하고 다른 등록된 관심사들에 대한 다른 알림들은 단 하나의 방법에 의해서만 제공되도록 선택할 수 있다. In any case, the user another notification for the selection to be provided by all available methods notifications are for the predetermined registered interests, and other properties interest may choose to provide only a single method. 게다가, 어떤 알림들은 비교적 즉시의 통지(relatively immediate notification)를 제공하는 푸시 방법(push method)으로 제공될 수 있다. In addition, some notifications may be provided to the push method (push method), which provides immediate notification of relatively (relatively immediate notification). 이 경우에, 본 발명은 저장된 연락 정보(contact information)를 이용하여 모든 선택된 전달 방법으로 사용자에게 알림을 전달할 것이다. In this case, the present invention is to deliver an alert to the user to all of the selected transmission method using the stored contact information (contact information). 이와 대조적으로, 다른 알림들은 다른 등록된 관심사들에 관한 사용자들로부터의 요구에 응답하여 알림으로서 응답하는 풀 방법(pull method)으로 제공될 수 있다. In contrast, other notifications can be provided to the pull method (pull method) to respond to a notification in response to a request from a user relating to the other properties concern. 그 요구들은 또한 주기적인 알림을 제공하도록 미리 정해진 횟수로 스케줄될 수 있다. That request may also be scheduled with a predetermined number of times to provide periodic reminders. 네트워크 상의 어떤 네트워크 어드레스 변환(NAT) 장치 배후로부터 본 발명과 통신하는 사용자들을 위해, 풀 방법은 사용자의 풀 요구에 의해 설정된 접속을 이용하여 사용자에게 알림을 송신한다. For users communicating with the invention from which a network address translation (NAT) device, behind the network, then pull method sends a notification to the user using the connection established by the user's pool request. 풀 알림이 얼마나 자주 제공되는가는 사용자가 본 발명의 풀 요구를 행하는 빈도에 의해 결정된다. How often is Available full notification is determined by the frequency of the user and performs the full requirements of the invention. 그러나, 푸시 방법은 NAT를 통하여 본 발명과 통신하지 않는 다른 사용자들을 위해, 긴급한 알림들보다 적게 제공하도록 선택된 시간 간격으로 제공될 수 있다. However, a push method may be provided in selected time intervals for other users who do not communicate with the present invention through the NAT, to provide less than the emergency notification. 알림의 히스토리(history of alerts)가 사용자에 대한 웹 페이지 상에 제공될 수 있다. The history of the alerts (history of alerts) can be provided on the web page for the user. 또한, 실질적으로 동일한 등록된 관심사들에 대한 알림들을 처리하기 위한 쿼리들(queries)이 결합되어 비교적 다수의 사용자들까지 본 발명의 범위 확장(scaling)을 가능케 할 수 있다. Further, substantially the query for processing notifications for the same registered interest (queries) are combined in a relatively up to a plurality of users to enable range extension (scaling) of the present invention. 범위성(scalability)을 더 가능케 하기 위하여, 등록된 관심사들에 대한 새로운 콘텐트 정보에 쿼리들의 부울(boolean) 사전 처리 및 사전 인덱싱이 적용될 수 있는데, 왜냐하면 그 새로운 콘텐츠 정보는 예컨대 확장성 마크업 언어 피드(XML feed)를 통하여 이용 가능하게 되기 때문이다. In order to enable more scalability (scalability), with the new content information on the registration concerns a boolean (boolean) pre-processing and pre-indexing of queries can be applied, because the new content information, such as extensible markup language feed because it is made available through the (XML feed). 다양한 정보를 포함하는 사용자 프로파일들이 또한 제공될 수 있는데, 그 정보는 등록된 관심사들에 대한 부울 쿼리, 전달 방법, 시간 스케줄 등을 포함하지만, 이들에 제한되는 것은 아니다. May also be provided to a user profile that includes a variety of information, the information comprises a Boolean query, the delivery method for the registered interest, time schedule, etc., but is not limited to these. 도 1은 본 발명에 따른 모범적인 알림 아키텍처를 예시한다. Figure 1 illustrates an exemplary notification architecture in accordance with the present invention. 이 알림 아키텍처는 하나 이상의 소프트웨어 모듈들 및/또는 서버, 클라이언트 장치 등과 같은 하나 이상의 컴퓨팅 장치들로 구현될 수 있다. This notification architecture can be implemented in one or more computing devices, such as one or more software modules and / or server, and client devices. 이 컴퓨팅 장치들은 일반적으로 프로세서, 메모리, 통신 인터페이스, 및 입출력 인터페이스, 저장 장치, 및/또는 다른 종래의 컴퓨팅 컴포넌트들을 포함한다. The computing device generally includes a processor, memory, communication interfaces, and input-output interface, a storage device, and / or other conventional computing components. 알림 처리 시스템(100a)은 소스 콘텐츠(101), 파트너 알림(102), 풀 콘텐츠(pull content)(122), 및/또는 클라이언트 장치들에 알림으로서 분배하기 위한 다른 콘텐츠 정보를 액세스한다. Notification processing system (100a) is accessible to the other content information to distribute a notification to the source content 101, the partner notification 102, the full contents (pull content) (122), and / or client device. 소스 콘텐츠(101)는 개인 광고, 쇼핑 가격, 뉴스 기사 등과 같은 각종의 콘텐츠를 포함할 수 있다. Content source 101 may include a variety of content such as personal ads and shopping prices, and news articles. 파트너 알림(102)은 주제별 서비스로부터 알림으로서 이미 제공될 수 있는 주식 시세, 경매 입찰 등과 같은 콘텐츠를 더 포함한다. The partner notification (102) further includes content from topics such as service announcements that may already be providing stock quotes, auction bids as. 소스 콘텐츠(101) 및/또는 파트너 알림(102)은 푸시(push)된 및/또는 풀(pull)된 콘텐츠일 수 있다. Source content 101 and / or partner notification 102 may be a push (push) and / or full (pull) content. 환언하여, 소스 콘텐츠(101) 및/또는 파트너 알림(102)은 이벤트 기반의 콘텐츠 피드(event based feeds of content) 및/또는 스케줄된 시간 기반의 콘텐츠 피드(scheduled time based feeds of content)일 수 있다. It may be in other words to the source content 101 and / or partner notification 102 of the event-based content feed (event based feeds of content) and / or of the scheduled time-based content feed (scheduled time based feeds of content) . 하나 이상의 피드 수집 서버들(feed collection servers)(103)은 도 2 및 3과 관련하여 더 상세히 설명되는 바와 같이 콘텐츠를 수신하고 입력 처리를 수행한다. One or more feed collecting server (feed collection servers) (103) receives the content, as will be described in more detail with respect to Figures 2 and 3, and perform the input process. 즉시 처리되지 않는 콘텐츠의 경우, 수집 서버들(103)은 그 콘텐츠를 저장 서버들(104)에 송신한다. For immediate raw content, the collecting server 103 transmits the content to the storage server 104. 하나 이상의 매칭 서버들(110)은 선택된 콘텐츠에 관한 알림들을 수신하는 것에 관심을 표시한 사용자들과 콘텐츠를 관련시킨다. One or more matching server 110 associates the user and the content indicated an interest in receiving notifications about the selected content. 일반적으로, 매칭 서버들(110)은 콘텐츠 소스가 사용자 요구와 이미 관련되어 있지 않은 콘텐츠를 푸시 입력할 때 이용된다. In general, the matching server 110 is used when a content source to enter the push content that is not already associated with the user request. 하나 이상의 유형의 알림들을 수신하는 것에의 관심은 사용자 데이터베이스(115)에 저장되어 있는 사용자 프로파일들에 표시된다. Of interest to receiving the one or more types of alerts are displayed to the user profiles stored in user database 115. 사용자 프로파일들은 사용자 ID(user identifiers), 원하는 알림 유형, 원하는 전달 방법, 및 다른 정보를 포함한다. User profiles includes a user ID (user identifiers), a desired notification type, desired delivery methods, and other information. 폴러(120)는 사용자를 대신하여 콘텐츠에 대한 요구들을 관리한다. Poller 120 on behalf of the user and manages the request for the content. 일반적으로, 폴러(120)는 콘텐츠 소스들로부터의 콘텐츠에의 액세스를 개시한다. In general, the poller 120 discloses an access to the content from the content source. 폴러(120)는 수집 서버들(103)에 콘텐츠를 푸시하지 않는 콘텐츠 소스들로부터의 어떤 독립적인 풀 콘텐츠(122)를 액세스할 수 있다. Poller 120 may be accessible to any independent full-content 122 from the acquisition server to the content source does not push content to (103). 하나 이상의 전달 서버들(130)이 매칭 서버들(110) 및 폴러(120)와 통신하고 있다. One or more distribution server 130 is in communication with matching server 110 and Poller 120. 전달 서버들(130)은 폴러(120)로부터의 풀 콘텐츠(122), 매칭 서버들(110)로부터의 푸시된 콘텐츠, 및 사용자 데이터베이스(115)로부터의 사용자 정보를 액세스한다. The delivery server 130 accesses the user information from the pushed content, and a user database 115 of the content from the pool 122, a matching server 110 from the Poller 120. 전달 서버들(130)은 즉시(immediate) 및 사전 스케줄된(pre-scheduled) 전달을 위해 알림들의 분배를 우선 순위화(prioritize)하고 관리한다. The distribution server 130 is immediately (immediate) and pre-scheduled (pre-scheduled) prioritize the notification of allocation for delivery (prioritize), and management. 사전 스케줄된 알림들은 하나 이상의 저장 서버 세트들(132a-132n) 상에 저장된다. Pre-scheduled reminder are stored on one or more storage servers set (132a-132n). 알림들이 준비되고 전달될 때, 사용자 모니터(140)는 패턴들 및/또는 다른 통찰력을 얻기 위해 알림들의 흐름을 관찰(watch)한다. When the notification ready to be delivered, the user monitor 140 observes (watch) a notification of the flow in order to obtain a pattern and / or other vision. 모니터(140)는 또한 웹 사이트 탐색, 온라인 구매 등과 같은 사용자 행동들에 관한 정보를 추적 및/또는 액세스할 수 있다. Monitor 140 can also be tracked and / or access to information on user behavior, such as website search, buy online. 추적된 행동들은 또한 사용자 데이터베이스(115) 내의 사용자 프로파일들에 저장되어 있는 사용자 관심사들을 표시한다. The tracking behavior can also display the user interests stored in the user profile in the user database (115). 로거(logger)(142)는 개개의 사용자들, 알림 유형들, 및 다른 파라미터들과 관련된 데이터를 추적한다. Logger (logger) (142) keeps track of the data associated with the individual users, the notification type, and other parameters. 디버거(144)는 알림 처리와 관련된 문제들을 해결(trouble shoot)하기 위해 이용된다. Debugger 144 is used to fix (trouble shoot) the problems associated with the notification process. 알림이 전달되어야 할 때, 그것은 사용자의 선호 방법(들)에 의한 전달을 위해 하나 이상의 적당한 서버들에 발송(route)된다. When the notification is to be forwarded, it is forwarded (route) on one or more servers suitable for delivery by the user's preferred method (s). 예를 들면, 이메일 알림들은 벌크 서버들(152)을 경유해 전달될 수 있다. For example, email notifications can be delivered via the bulk server (152). 무선 모바일 장치들에의 알림들은 무선 서버들(154)을 경유하여 전달될 수 있다. Notifications are wireless server 154 of the wireless mobile unit can be transmitted via. 인스턴트 메시징 알림들은 인스턴트 메시징 서버들(156)을 경유해 전달될 수 있다. Instant messaging notifications can be delivered via the instant messaging server (156). 각각의 알림은 일반적으로 네트워크(160)를 통하여 사용자 프로파일에 식별된 클라이언트 장치에 통신된다. Each notification is generally via a network 160, communication with the client device identified in the user profile. 사용자는 그 알림이 퍼스널 컴퓨터(PC)(162), 모바일 단말기(164), 핸드헬드 컴퓨터(166), 및/또는 등등의 것 중 하나 이상의 것에 전달됨을 표시할 수 있다. The user may display a notification that the personal computer (PC) (162), the mobile terminal 164 and passed to one or more of that of the hand-held computer 166, and / or so on. 또한 하나 이상의 미러링된 알림 처리 시스템들(100b)과 통신하기 위해 미러 인터페이스(158)가 사용될 수 있다. There is also a mirror interface 158 may be used to communicate with one or more mirrored notification processing systems (100b). 위에서 소개된 데이터 및 처리 동작들의 전부 또는 일부는 동일한 및/또는 상이한 위치들에서 병렬 처리를 위해 재현(reproduce)될 수 있다. All or part of the data and the processing operations outlined above may be repeated (reproduce) for parallel processing in the same and / or different position. 미러 인터페이스(158)는 중앙 통신 인터페이스를 포함하고 및/또는 위에서 논의된 각각의 서버들 내에 분산될 수 있어, 각각의 서버 유형이 미러링된 서버 유형들과 통신할 수 있다. Mirror interface 158 may communicate with a central communication interface, and / or can be dispersed within the respective servers discussed above, each of the server type, the mirroring server type. 각각의 미러링된 알림 처리 시스템에서, 각각의 서버 유형의 동작들은 국부적으로 고유한 팩터들(locally unique factors)에 대해 개별화(customize)될 수 있다. In each of the mirrored notification processing system, each of the server type of operation may be personalized (customize) for the unique locally factor (locally unique factors). 도 2는 도 1과 관련하여 설명된 아키텍처에 대응하는 기능 엘리먼트들 간의 관계 및 데이터 흐름을 예시하는 기능 블록도이다. 2 is a functional block diagram illustrating the relationship and data flow between the functional elements corresponding to the architecture described in conjunction with FIG. 푸시된 또는 풀된 소스 콘텐츠(170)는 예를 들어 HTML(hypertext markup language) 문서로서, XML 문서로서, 텍스트 파일로서, 이메일 메시지로서, 인스턴트 메시지로서 등등을 포함하는 하나 이상의 형태로 수신된다. Or a pooled source content 170 is pushed, for example as an HTML (hypertext markup language) document, an XML document, a text file, is received as e-mail messages, to one or more forms, including so as instant messages. 필요에 따라, 수집 처리 모듈(172)이 수신된 콘텐츠에 대해 하나 이상의 사전 처리 동작들을 수행하여 수신되는 콘텐츠의 다양한 형태들을 정규화(normalize)한다. Normalize (normalize) the various types of content that are received by performing, collection processing module 172 has one or more pre-processing operations on the received content if necessary. 정규화된 콘텐츠 문서들은 피드 저장소(feed storage)(104a)에서의 용이한 저장 및 검색을 위해 일반적으로 소스, 타임-스탬프, 콘텐츠 유형, 및/또는 다른 특징들에 의해 인덱싱되고, 피드 저장소는 또한 저장 디렉터리 경로에 기초하여 URL(universal resource locator)을 할당한다. The normalized content documents are usually the source, the time for easy storage and retrieval of the feed store (feed storage) (104a) - is indexed by the stamp, content type, and / or other characteristics, feed store is also saved It assigns a URL (universal resource locator) on the basis of the directory path. URL은 나중의 검색을 위해 수집 처리 모듈(172)이 이용할 수 있게 된다. URL will be able to collect the processing module 172 can be used to search for later. 수집 처리에 대해서는 도 3과 관련하여 더 상세히 설명된다. For the collection processing with respect to Figure 3 is described in further detail. 관리 인터페이스(174)는 상태 획득, 검색, 콘텐츠 수동 입력 등과 같은 검토 및/또는 관리 기능들을 위해 수신된 데이터를 액세스하기 위해 이용 가능하다. Management interface 174 may be used to access the data received for review and / or management functions such as acquisition state, search, content manual input. 관리 인터페이스(174)는 또한 시스템이 적절히 동작하고 있음을 보증하기 위해 추적되는 테스트 콘텐츠의 하트비트 피드(heartbeat feeds)를 셋업하기 위해 이용될 수도 있다. Management interface 174 may also be used to set up a feed heartbeat (heartbeat feeds) content of the test track to ensure that the system is operating properly. 만일 착신되는 콘텐츠 유형이 주식 시세를 포함한다면, 매칭 엔진(110a)은 부울 쿼리를 적용하여 주식 시세 콘텐츠가 선택된 회사에 관한 정보를 포함하는지 그리고 가격이 $100보다 큰지 여부를 판정한다. If the content type of the incoming call, including stock quotes, matching engine (110a) is that it contains information relating to the stock ticker content is selected company by applying Boolean query and determines whether or not the price is greater than $ 100. 만일 주식 시세가 매칭 콘텐츠를 포함한다면, 매칭 엔진(110a)은 그 사용자를 그 매칭 콘텐츠에 관한 알림을 원하는 사용자들의 목록에 추가한다. If the stock price is a matching content matching engine (110a) will be added to the list of users that you want the user to be notified of the matching content. 여러 다른 사용자들이 유사한 쿼리를 갖거나, 및/또는 착신되는 콘텐츠를 서로 다른 쿼리들과 매칭시킬 수 있다. There are many others can match the content that has a query or similar, and / or together with other incoming queries. 범위성(scalability)을 위한 성능을 향상시키기 위하여, 매칭 엔진(110a)은 쿼리들의 인덱스를 유지하고 각각의 쿼리를 동일하거나 매우 유사한 쿼리 결과들을 원하는 사용자들에 관련시킨다. Range in order to improve the performance property for (scalability), the matching engine (110a) keeps the index of the query and related to the desired result of each query, the same or very similar to the user query. 쿼리들의 인덱스는 쿼리 동작들의 중복을 감소시킨다. An index of the query to reduce the redundancy of the query operation. 장래에 착신되는 콘텐츠는 이들 사전 인덱싱된 쿼리들과 대조하여 분석(resolve)될 수 있다. Content that is called in the future, may be analyzed (resolve) In contrast with these prior indexed query. 결과적으로 매치가 되는 임의의 쿼리들에 대하여, 대응하는 사용자 ID가 목록에 추가된다. As a result, with respect to any of the query that match, the user ID is added to the corresponding list. 또한 이메일, 인스턴스 메시지, 셀 방식 휴대 전화 등과 같은 사용자가 원하는 전달 방법이 사용자의 프로파일로부터 취해져서 목록에 포함된다. In addition, delivery method, a user, such as e-mail, instant messages, a cellular phone is taken from the desired user profile is included in the list. 유사하게, 원하는 전달 시간이 사용자 프로파일 내에 특정될 수 있다. Likewise, the desired delivery times may be specified in the user profile. 또한 사용자에게 송신되는 알림들 및/또는 다른 메시지들의 수를 제한하기 위해 사용자 프로파일에 메시지 한도(message limit)가 제공될 수 있다. Also it may be provided with a limit message (message limit) the user profile in order to limit the number of alerts and / or other messages to be sent to the user. 쿼리들은 콘텐츠의 유형, 컴퓨팅 장치들의 현재 부하, 및/또는 다른 특성들에 기초하여 컴퓨팅 장치들 사이에 분배될 수 있다. Queries are based on the current load, and / or other characteristics of the type of content, the computing device may be distributed among computing devices. 콘텐츠에 대해 모든 쿼리들이 수행되었을 때, 매칭 엔진(110a)은 그 콘텐츠 및 목록을 전달 인터페이스(130a)에 중계할 준비를 한다. When the content is for all queries are performed, the matching engine (110a) is ready to relay the content list and the delivery interface (130a). 중계 전에, 매칭 엔진(110a)은 또한 사용자 프로파일 데이터, 콘텐츠의 유형, 송신될 알림의 유형(들) 등에 기초하여 우선 순위를 결정할 수 있다. Before transit, the matching engine (110a) may also determine the priority based upon the user profile data, the type of content, type of notification to be transmitted (s) or the like. 우선 순위(priority)는 때때로 서비스 품질(QOS) 레벨로 불린다. Priority (priority) is sometimes referred to as Quality of Service (QOS) level. 예를 들면, 주식 가격 콘텐츠는 전형적으로 매우 시간에 민감하므로, 매칭 엔진은 주식 가격 콘텐츠를 사용자들에게 매칭시키는 것에 보다 높은 우선 순위(예컨대, 높은 QOS 레벨)를 적용할 수 있다. For example, a stock price can be so typically very sensitive to the time matching engine can be applied to the highest priority (for example, a high level of QOS) than what the stock price to match content to users. 또 다른 예로서, 매칭 엔진은 사용자 프로파일 데이터(115a)를 이용하여 유급 서비스 플랜들(paid service plans) 및/또는 다른 특징들에 따라서 사용자들에 대한 발신 알림들을 우선 순위화할 수 있다. As yet another example, the matching engine may prioritize the outgoing notification to the user according to the service plan of the paid (paid service plans) and / or other characteristics by using the user profile data (115a). 스케줄된 시간 기반 피드를 이용한 풀된 콘텐츠에 대해, 폴러(120a)는 표시된 콘텐츠 유형에 대한 알림을 원하는 하나 이상의 사용자들에 대한 콘텐츠를 요구한다. For using the scheduled time-based feed can be pooled, the poller (120a) requests the content for one or more users want to be notified of the type of content displayed. 폴러(120a)는 수집 처리 모듈(172)로부터 또는 수집 처리 모듈(172)에 콘텐츠를 공급하도록 예정(pre-arrange)되어 있지 않을 수 있는 외부 소스들로부터 직접 콘텐츠를 풀할 수 있다. Poller (120a) may pulhal content directly from the external source may not be expected (pre-arrange) to supply a content processing module for collecting collection processing module 172 or from 172. 외부 콘텐츠는 정규화되고 다르게는, 요구된 콘텐츠가 폴러(120a)에 송신되기 전에 콘텐츠 소스에 의해 사전 처리되어 있지 않다면, 위에서 설명된 방식으로 사전 처리된다. External content is normalized Alternatively, if not the requested content has been pre-processed by the content source before it is sent to the poller (120a), is pre-treated in the manner described above. 폴러 처리에 관한 더 상세한 내용에 대해서는 도 4 및 5를 참조하여 후술된다. For more details about the polar processing are described below with reference to Figs. 어쨌든, 콘텐츠가 최종 사용자에게 전달되어야 할 때, 도 2에 도시된 전달 인터페이스(130a)가 사용자들이 원하는 하나 이상의 방법으로 알림을 발생시킨다. In any case, when the content is to be delivered to end users, it generates a notification also by one or more of the passed interface (130a) shown in Figure 2 users want. 예를 들면, 어떤 사용자들은 셀 방식 휴대 전화 번호로 단문 메시지 서비스(SMS) 메시지들로서 전달되는 알림을 원할 수 있다. For example, some users may desire the notification transmitted as a short message service (SMS) message to a cellular phone number. 전달 인터페이스(130a)는 일반적으로 전달 방법에 대응하는 템플릿을 사용한다. Passing interface (130a) generally uses a template corresponding to the transmission method. 템플릿을 콘텐츠 문서 또는 그 콘텐츠 문서에 대한 URL에 적용하여 최종 알림을 발생시킨다. By applying a template, the URL for the document content, document or its contents to generate the final notification. 전달 인터페이스(130a)는 또한 각 사용자에 대한 알림 전달의 타이밍 및/또는 다른 QOS 특징들을 관리한다. Passes interface (130a) also manage the timing and / or other QOS features of the notification delivery for each user. 예를 들면, 어떤 알림들은 즉시 전달되는 반면, 다른 알림들은 나중의 전달을 위해 스케줄될 수 있다. For example, some notifications are delivered immediately while the other notifications can be scheduled for delivery later. 다른 예들로는 지리적 위치, 사업 파트너, 콘텐츠 소스, 및/또는 다른 파라미터들에 기초한 발송 배정(arranging for routing)을 포함한다. Other examples include include geographic location, business partners, content source, and / or send assignments (arranging for routing) based on other parameters. 전달 인터페이스(130a)는 또한 전달 불가능한 알림, 및/또는 다른 유지 보수(maintenance) 문제들을 관리한다. The passing interface (130a) is also impossible to manage the delivery notification, and / or other maintenance (maintenance) issues. 전달에 관한 더 상세한 내용에 대해서는 도 6과 관련하여 후술된다. For further details of the transmission it will be described below in connection with FIG. 콘텐츠 수집 처리에 대해서는 더 상세히 설명하지 않는다. For the content acquisition processing it will not be described in further detail. 도 3은 수집된 콘텐츠를 처리하기 위한 모범적인 논리를 예시하는 흐름도이다. Figure 3 is a flow chart illustrating an exemplary logic for processing the collected content. 동작 180에서, 콘텐츠가 수신될 때, 소스가 인증된다. In operation 180, when the content is received, the source is authenticated. 인증 및/또는 다른 보안 조치들은 디지털 인증서, 디지털 서명, 암호화, 가상 사설망 터널 등을 포함한 하나 이상의 방법으로 구현될 수 있다. Certification and / or other security measures can be implemented in one or more ways, including digital certificates, digital signatures, encryption, virtual private network tunnels. 콘텐츠에 대한 소스는 또한 도메인 보안 메커니즘으로 인증될 수 있으며, 이 도메인 보안 메커니즘은 주식회사 야후(Yahoo!, Inc.)가 제공한 것과 같은 도메인 키 애플리케이션을 포함하지만, 이것에 제한되는 것은 아니다. Source for the content may also be authenticated by the domain security mechanism, the domain security mechanism includes a domain key applications, such as those provided by the Corporation Yahoo (Yahoo !, Inc.), but is not limited to this. 동작 182에서, 수신된 콘텐츠는 XML 포맷과 같은 정규화 콘텐츠 포맷으로 변환된다. In operation 182, the received content is converted into a normalized content formats, such as XML format. 표 1은 샘플 XML 데이터 구조를 예시한 것으로, 수신된 콘텐츠는 후속 처리 및 최종적으로 알림으로서 전달을 위해 XML 데이터 구조로 정규화된다. Table 1 as an illustration of a sample XML data structure, the received content is normalized with the XML data structure for delivery as a reminder to the subsequent processing and final. FeedProvider FeedProvider 피드 제공자의 명칭(로이터, AP). Name of feed provider (Reuters, AP). 피드 제공자들은 구성 파일(config file)로부터 검증될 필요가 있다. Feed provider need to be verified from a configuration file (config file). Type Type 피드의 유형. The type of feed. 이 필드는 편집 페이지들과 관련하여 작용한다. This field works in conjunction with the edit page. 편집 페이지는 각 알림을 특정 유형과 함께 저장한다. Edit page stores each notification with a specific type. 각 알림 유형은 문자열로서, 예를 들면 재정/인용/실시간/개인 소식(personals)이다. Each alert type is a string, for example, financial / quote / RT / personal news (personals). Alert_Data Alert_Data 이 태그의 자식들(children)은 이메일 포맷팅을 위해 필요한 임의의 추가 데이터 및 태그들을 포함할 수 있다. The children of this tag (children) may include any additional data and tags necessary for formatting email. 각각의 자식 태그는 키-값 쌍으로서 이메일 포맷팅 시스템에게 이용 가능할 것이다. Each child tag key-formatted e-mail will be available to the system as a value pair. 다음 코드는 알림을 발생시키기 위해 이용될 수 있는 교통 사건에 관한 샘플 정규화된 XML 콘텐츠 문서를 예시한다. 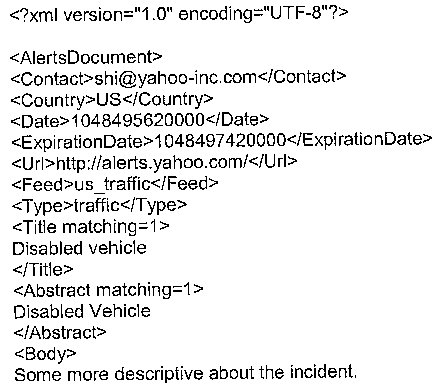 The following code sample illustrates the normalized XML document contents about traffic events that can be used to generate alerts. 동작 184에서, 수집 처리 모듈은 콘텐츠를 검증 확인(validate)하여 소스로부터 필요한 데이터가 포함되었는지를 검증한다. In operation 184, the collection processing module verifies that the verification check (validate), including the required data from the content source. 검증 확인(validation)은 또한 이전에 수신된 중복 콘텐츠를 업데이트하는 것 및/또는 제거하는 것, 및/또는 다른 데이터 무결성 측면들을 보증하는 것을 포함할 수 있다. Validation checks (validation) can also be included to ensure that things that you update your duplicate content previously received and / or removed, and / or other data integrity. 게다가, 검증 확인은 콘텐트가 인증된 소스로부터 정확히 수신된 것인지를 검증하는 것을 포함할 수 있다. In addition, validation checks may include verifying whether the content has been correctly received from the authenticated source. 검증 확인은 암호화/복호화, 디지털 서명, 디지털 인증서, 암호(passwords), 대칭 키 쌍, 비대칭 키 쌍 등의 검증 확인을 포함할 수 있다. Validation checks can include validation checks such as encryption / decryption, digital signatures, digital certificates, passwords (passwords), symmetric key pair, an asymmetric key pair. 전형적으로, 정규화된 XML 콘텐츠 문서는 추가 변경 없이 처리될 수 있다. Typically, the normalized XML document content can be processed without further changes. 그러나, 피드 변환 동작(185) 동안에 어떤 변경들이 적용될 수 있다. However, some changes may be applied during the feed conversion operation 185. 많은 경우에, 콘텐츠 피드 변환(content feed transformation)은 검증 확인 문제들을 처리(address)하기 위한 단순 문자열 치환(simple string substitutions) 또는 사소한 포맷팅 변환(formatting conversions)을 포함할 것이다. In many cases, the content feed conversion (content feed transformation) will contain a simple string substitutions (simple string substitutions) or minor formatting conversion (formatting conversions) for processing (address) the verification confirmed the problem. 그렇지만, 더욱 복잡한 논리 동작들이 수행될 수 있다. However, there may be more complex to perform logical operations. 예를 들면, 착신되는 주식 시세를 이전의 주식 시세와 비교하여 주식 가격에서 미리 정해진 비율 변화(predefined percentage change)가 발생하였는지 여부를 판정할 수 있다. For example, it can be compared to the incoming stock quotes the previous stock quote to determine whether a predetermined percentage change in the stock price (predefined percentage change) occurs. 하루의 개장 이후 소정 주식의 가격이 소정의 비율만큼 변화했을 때 알림을 요구한 다수의 사용자들이 있을 수 있다. Since the opening of the day, the price of certain stocks can be multiple users requiring notification when a change in a predetermined ratio. 수집 처리 모듈은 주식 시세 데이터를 사용자들과 관련시키기 전에 현재의 비율 변화를 미리 계산할 수 있어, 그 다수의 사용자들에게 알림이 송신되어야 할지를 판정하는 데 처리 자원들이 사용될 필요가 없거나 또는 중복될 필요가 없다. Collection processing module that can pre-calculate the current ratio changes, or is that a number of needs for users processing resources to be used to determine whether the notification is to be sent or to be duplicated before the relevant stock quote data, and users none. 동작 186에서, 수집 처리 모듈은 또한 다수의 메트릭(metrics)에 기초하여 콘텐츠를 저장, 탐색, 검색, 추적, 및/또는 조직하기 위해 콘텐츠를 인덱싱한다. In operation 186, the collection process module may also index the plurality of stored content on the basis of the metric (metrics), browse, search, tracking, and / or content to the organization. 메트릭들 중 일부는 정규화된 콘텐츠 문서의 정규화된 데이터 구조에 고유한 것이지만, 이 메트릭들은 또한 상태 정보 및 보고를 위한 인덱스 문서에 저장될 수도 있다. Some of the metric, but is unique to a normalized data structure of the normalized document content, this metric may also be stored in the index for the document status information and reported. 메트릭의 예로는 콘텐츠가 수신된 시간, 송신자의 ID, 콘텐츠가 송신된 국가, 콘텐츠의 유형, 콘텐츠가 폴 요구와 관련이 있는지 여부, 콘텐츠가 이전에 수신된 콘텐츠와 관련이 있는지 여부 등을 포함한다. The examples of metrics include the content is received, time, sender's ID, the content is transmitted country, type of content, whether the content is relevant to Paul's needs, whether including that related to the content previously received content . 다량의 착신되는 콘텐츠에의 액세스를 편하게 하는 것 외에, 수집 처리 모듈은 메트릭들을 이용하여, 중복 콘텐츠를 삭제하고, 콘텐츠를 필터링하여 사소한 개정들(revisions)을 식별하는 것 등과 같은 하우스키핑(housekeeping) 및 최적화를 동작 188에서 수행할 수 있다. In addition to easy access to much of the incoming content collection processing module housekeeping (housekeeping), such as using the metric, to delete the duplicate content and filter the content identifies the minor revisions (revisions) and the optimization can be performed in operation 188. 이를테면, 뉴스 기사에서 철자법 에러가 정정되어 콘텐츠 소스로부터 재송신될 수 있다. For instance, it is a spelling error correction in a news article can be retransmitted from the content source. 사용자는 단지 철자법 정정으로만 동일한 뉴스 기사의 2번의 알림을 원할 것 같지 않다. The user is not likely to just want a second one notification for the same news story as spelling correction. 만일 처음 뉴스 기사가 이미 송신되었다면, 차이 임계치가 초과되지 않는 한, 두 번째 버전은 삭제될 수 있다. If ten thousand days have already sent the first news article, one, the second version of the difference it does not exceed the threshold may be removed. 대안으로, 만일 뉴스 기사가 알림으로서 이미 송신되지 않았다면, 뉴스 기사의 처음 버전은 정정된 버전으로 대체되어 대기 행렬에 들(queue up) 수 있어 하나의 알림만이 스케줄된 시간에 사용자들에게 송신된다. Alternatively, if you have not already been transmitted as a ten thousand and one news story alerts, the first version of the news article is replaced by a corrected version is sent to the user in the only one notification schedule time can in a queue (queue up) . 메트릭들의 인덱스 문서 및/또는 콘텐츠 문서는 일반적으로 피드 저장소에 저장된다. Index documents and / or the content of the document, the metric is typically stored in a feed store. 각각의 저장된 인덱스 문서는 그 인덱스 정보에의 편한 액세스를 위해 인덱스 URL(index universal resource locator)에 의해 식별된다. Each of the stored index page is identified by an index URL (universal resource locator index) for easy access to the index information. 상기 동작들 전반에 걸쳐서, 수집 처리 모듈은 매칭 엔진을 돕기 위해 태그 및/또는 다른 코드를 삽입할 수 있다. Over the first half of the operation, collection processing module can be inserted into the tag and / or other code to assist in the matching engine. 예를 들면, 위에서 설명된 동일 XML 문서와 관련하여, 수집 처리 모듈은 <AltersDocument> 태그의 각각의 즉시 CDATA 자식(immediate CDATA child)에 선택 사양의 '매칭' 속성을 적용할 수 있다. For example, in relation to the same XML document described above, the collection process module may apply the "match" attribute of the selected <AltersDocument> each immediate child of the CDATA tag (immediate child CDATA) specifications. 매칭 엔진은 '매칭' 태그를 찾아 문서를 스캔하고 쿼리 표현식(들)을 텍스트 엘리먼트에 적용하여 그 문서와 매칭하는 사용자 ID를 판정할 수 있다. Matching engine can determine a user ID that matches the document to scan a document and find the 'match' tag and apply the query expression (s) in the text element. 도 4는 스케줄된 알림(scheduled alerts)을 생성하기 위해 폴링된 콘텐츠(polled content)를 관리하기 위한 폴러 아키텍처(poller architecture)를 예시한다. 4 illustrates the polar architecture (architecture poller) for managing the polling schedule to produce a notification (scheduled alerts) the content (content polled). 거기에는 N개의 폴러 서버(180a 내지 180n)와, 주(primary) PMS(182) 및 일반적으로 백업으로서 기능하는 부(secondary) PMS(184)를 포함하는 적어도 2개의 폴러 매니저 서버(PMS)가 있다. There are at least two polar manager server (PMS), which includes N poller server (180a to 180n), and a main (primary) PMS (182) and generally portion (secondary) PMS (184) functioning as a backup . 각각의 폴러 서버는, 논블로킹(non-blocking) I/O를 이용하여, 개인 광고, 일기 예보 등과 같은 알림 유형에 기초하여 하나 이상의 원하는 콘텐츠 소스들(122a)로부터의 다수의 폴들을 핸들링하는 다수의 프로세스들을 실행한다. A plurality of handling each of the poller server, non-blocking (non-blocking) I / O by using the personal ad, a number of the pole from weather forecast desired content sources of one or more on the basis of the type of notification, such as (122a) It executes the process. 원하는 콘텐츠는, 예컨대 HTTP 인터페이스를 통하여, 수집 처리 모듈로부터 폴러(120)에 통신되고 및/또는 독립적으로 액세스될 수 있다. The desired content, for example, be Poller communication and / or independently access 120 from the collection processing module via an HTTP interface. 각각의 폴러 서버는 96 버클리 DB 파일들과 같은 데이터베이스 파일들 내에 사용자 ID마다 동일한 알림 정보를 저장한다. Each poller server stores the same notification information for each user ID in the database file, such as the 96 Berkeley DB files. 각각의 파일은 15분 - 24 x 4와 같은 시간 슬롯을 나타낸다. Each file 15 minutes indicates the time slot, such as 24 x 4. 사용자 데이터베이스(115) 내의 사용자의 프로파일 내에 알림 요구가 삽입되면, 제공자 코드, 알림 유형, 프리미엄 플래그, 및/또는 등등의 것에 기초하여 QOS 값이 계산된다. When the notification request is inserted in the user's profile in the user database 115, the provider code, the notification type, and the QOS value calculated on the basis that the flag premium, and / or so on. 스케줄된 알림은 대응하는 기간에서의 분배를 위해 전달 서버(들)(130)에 통신된다. A scheduled alert is communicated to the delivery server (s) 130 for distribution in the corresponding period. 도 5는 시간 기반 알림을 준비하기 위한 논리를 예시하는 흐름도이다. Figure 5 is a flow diagram illustrating the logic for preparing a time-based notifications. 동작 200에서, 폴러 서버는 미리 정해진 기간이 경과한 후에 깨어나서 주 PMS에게 일깨움 신호(wakeup signal)를 송신한다. In operation 200, the poller server transmits the wakeup signal (wakeup signal) to the main PMS wakes up after a predetermined period has passed. 만일 주 PMS가 다운되어 있으면, 일깨움 신호는 부 PMS에 발송된다. If there main PMS is down, the wake up signal is sent to the sub-PMS. 일깨움 신호는 폴러 서버가 하나 이상의 미리 정해진 알림 유형들에 대응하는 콘텐츠에 대해 폴링하기 위해 이용 가능하다는 것을 나타낸다. Wake up signal indicates that the available to poll for the content corresponding to the poller server is one or more predetermined types of notifications. 일깨움 신호들은 PMS가 갑자기 일깨움 신호들로 초과 실행(overrun)되지 않도록 조절(throttle)될 수 있다. Wakeup signals may be PMS-controlled (throttle) so that it is not running in excess of a sudden awakening to the signal (overrun). PMS가 일깨움 신호를 수신하면, 동작 202에서 PMS는 PMS의 메모리 내의 폴러 서버 목록에 현재 이용 가능한 폴러 서버를 추가한다. If the PMS receives a wake up signal, at operation 202 PMS is added to the currently available poller servers to the list in the memory of the server Poller PMS. 동작 204에서, PMS는 알림 목록 페치 요구(fetch_alerts_list request)를 송신하여 PMS의 목록 상의 제1 폴러 서버가 개인 광고, 교통 보고 등과 같은 하나 이상의 콘텐츠 아이템들을 액세스하게 한다. In operation 204, PMS is the notification by transmitting a fetching request list (fetch_alerts_list request) to access one or more items of content, including the first polar server on the list of PMS individuals advertising, traffic reports. 동작 206에서, 폴러 서버는 페치 요구를 수신하고, 원하는 콘텐츠 아이템(들)을 액세스하고, 그 콘텐츠 아이템(들)을 PMS에 송신한다. In operation 206, the poller server receives the fetch request, to access the desired content item (s), and transmits the content item (s) to the PMS. 콘텐츠 아이템(들)을 액세스하기 위하여, 폴러 서버는 저장된 사용자 선호에 의해 정의된 쿼리 및/또는 다수의 사용자들이 원하는 통합된 쿼리(consolidated query)를 수행한다. In order to access the content item (s), polar server performs the query and / or a plurality of integrated query users want (consolidated query) defined by the stored user preferences. 만일 쿼리로부터 아무런 결과도 찾지 못하면, 폴러 서버는 선택 사양으로(optionally) 쿼리를 넓혀서 다시 시도할 수 있다. Ten thousand days if no results from the query also found, the poller server specifications (optionally) widen the query selection can try again. 콘텐츠 아이템(들)은 15분 슬롯과 같은 현재의 미리 정해진 기간에 대응한다. The item of content (s) corresponding to the current predetermined period of time, such as 15-minute slots. 폴러 서버는 콘텐츠 아이템(들)을 PMS에 반환하기 전에 그 콘텐츠 아이템(들)을 QOS 레벨들에 따라서 우선 순위화할 수 있다. Poller servers that content item (s) before returning the content item (s) in the PMS can prioritize according to the QOS levels. 동작 208에서 PMS는 다수의 폴러 서버들로부터의 반환된 콘텐츠 아이템들을 표들(tables) 내로 필터링한다. In operation 208 PMS is filtering the returned item of content from multiple servers into a polar tables (tables). 표들은 알림 유형, 사용자 서비스 플랜 등의 QOS 레벨들에 기초한다. Table are based on the QOS levels, such as the notification type, the user service plan. 예를 들면, 콘텐츠 아이템들은 우선 순위 레벨들에 대응하는 QOS 표 3, QOS 표 2, QOS 표 1 및 QOS 표 0으로 분류(sort)된다. For example, the content items are the QOS priority is shown in Table 3, sorted (sort) the QOS Table 2, Table 1 and QOS QOS Table 0 corresponding to the priority levels. 각각의 콘텐츠 아이템은 또한 그 콘텐츠 아이템이 표들 중 하나에 추가될 때 할당된 타임스탬프를 가질 것이다. Each item of content will also have a time stamp is assigned when the content item is added to one of the tables. 타임스탬프는 PMS가 콘텐츠 아이템이 알림으로 처리되지 않고 표에 있었던 시간의 길이를 추적하는 것을 가능케 한다. The time stamp allows that PMS is not treated as an item of content alerts track the length of time that was in the table. 일반적으로, 임계 길이 시간을 초과하여 표에 머무르는 콘텐츠 아이템은, 부하(load)에 대해 폴러 서버들이 충분히 없음을 나타낸다. In general, the threshold beyond the time length of the content item to stay on the table represents the Poller are not enough for the server, the load (load). 미리 정해진 간격으로 콘텐츠 아이템들에 대해 폴링하는 것 외에, 폴링 서버들은 전달될 대응하는 알림들을 준비하는 동작들을 수행한다. In addition to that polling for the content items at predetermined intervals, polling servers are ready to perform the operation corresponding to the notification to be delivered. 따라서, 동작 210에서, 폴러 서버들은 작업을 요청하는 요구들을 PMS에게 송신한다. Thus, in operation 210, the poller servers and it transmits the request for requesting the operation to the PMS. PMS는 일반적으로 표들로부터의 콘텐츠 아이템들을 QOS 레벨들의 순서에 기초하여 폴러 서버들에게 송신한다. PMS is typically based on the item of content from the tables in the order of the QOS level, and transmits to the poller server. 폴러 서버들은 기존의 쿼리 결과들을 현재의 콘텐츠 아이템(들)과 비교하는 것과 같은 논리 동작들을 수행한다. Poller servers which performs logical operations such as comparing the existing query results with the current content item (s). 예를 들어, 만일 현재의 콘텐츠 아이템이 기존의 쿼리 결과와 다르다면, 폴러 서버는 기존의 쿼리 결과를 현재의 콘텐츠 아이템으로 교체할 수 있다. For example, If the current content item differs from traditional query results, poller server can replace the existing query results into the current content item. 스케줄된 알림들은 장기간 동안 전달되지 않을 수 있으므로, 콘텐츠는 대응하는 알림이 최종적으로 전달되기 전에 여러 번 업데이트될 수 있다. It may not have delivered the notification schedule for a long period of time, the content can be updated multiple times before being transferred to the corresponding final notification. 일단 폴러 서버가 그것의 작업을 마치면, 폴러 서버는 콘텐츠 아이템이 처리되었고 알림이 생성되었음을 나타내는 확인 응답(acknowledgement)을 PMS에게 송신한다. Once the poller server finishes its work, the poller server sends an acknowledgment (acknowledgement) indicating that the content item has been processed notifications are generated for PMS. 폴러 서버는 또한 콘텐츠 아이템을 갖는 알림을 전달하라는 요구를 전달 서버에게 송신하고, 폴러 서버는 더 많은 작업을 요청한다. Poller server also sends the request to deliver notifications with a content item to the delivery server, the server poller to request more work. 확인 응답을 수신함과 동시에, PMS는 동작 212에서 콘텐츠 아이템을 그것의 대응하는 표로부터 제거하여, 대응하는 알림 작업이 완료되었음을 나타낸다. And receiving an acknowledgment at the same time, PMS shows that by removing the item of content in operation 212 from its corresponding table, the notification operation is complete, the corresponding. 판정 동작 214에서, PMS는 각 표로부터 모든 콘텐츠 아이템들이 제거되어, 각 QOS 레벨에 대한 모든 작업들이 완료되었음을 나타내는지를 판정한다. At decision operation 214, PMS determines whether to indicate that complete all the operations for all of the content items have been removed, each QOS level from each of the tables are. 만일 각 표가 비어 있다면, 처리는 바로 동작 200으로 복귀하여 또 다른 일깨움 신호를 기다린다. If the tables are empty, the process returns to operation 200 just waits for another wakeup signal. 만일 각 표가 비어 있지 않다면, PMS는 모든 그것의 작업들을 완료할 수 없었고, PMS는 에러를 로깅할 수 있다. If you do not have empty tables each, PMS could not complete all of its work, PMS can log the error. 임의의 남아 있는 미처리 콘텐츠 아이템들은, 동작 216에서, 다음 기간 동안 얻어지는 임의의 새로운 콘텐츠 아이템들과 병합된다. Any remaining unprocessed item of content in the can, in operation 216, are merged with any new content items obtained during the next period. 도 6은 1인 이상의 사용자들에게 알림을 전달하기 위한 모범적인 논리를 예시하는 흐름도이다. Figure 6 is a flow chart illustrating an exemplary logic for transmitting the notification to the one or more users. 위에서 간략히 논의된 바와 같이, 전달 서버들 및 저장 서버들은 일반적으로 송신 서버들과 인터페이스하여 각종의 방법으로 알림을 전달하기 위한 전달 서브시스템을 포함한다. As briefly discussed above, includes a distribution server and transfer subsystem for storing the server are generally delivered as a notification of various ways to interface with the transmission server. 전달 서브시스템의 모든 컴포넌트들은 하드웨어 및/또는 소프트웨어 구성들의 임의의 조합을 포함할 수 있다. All the components of the delivery subsystem may include any combination of hardware and / or software configuration. 이 유연성으로 인해, 제한된 하드웨어 자원들을 갖는 국제 사이트 상에서와 같은, 변화하는 환경에서의 알림의 전개(deployment)가 가능해진다. Due to this flexibility, the deployment (deployment) of the notification, in a changing international environment, such as on sites with limited hardware resources is possible. 예컨대 전달 서버가 새로 설치되거나 또는 얼마간의 시간 동안, 및/또는 소정의 미리 정해진 주기로 오프라인 상태 후에 서비스하기 위해 복귀한 경우와 같은, 초기화 동작 220에서, 전달 서버들은 또 다른 활성 상태의(live) 전달 서버로부터 및/또는 관리 인터페이스와 같은 또 다른 소스로부터 업데이트된 템플릿들을 수신한다. For example, the delivery server, the installation or some time a new, and / or in the initializing operation 220, such as when a return to service after the offline period specified predetermined in advance, the delivery server may deliver addition of other active (live) It receives the updated template from another source, such as from a server and / or the management interface. 모든 전달 서버들은 전달 서버 세트 전체에 걸쳐서 자동으로 전파된 동일한 템플릿들의 세트를 갖고 있어야 한다. All servers must have passed a set of identical templates automatically propagate throughout the delivery server set. 동작 221에서, 전달 서버(들)는 하나 이상의 메시지를 하나 이상의 사용자들에게 전달하라는 하나 이상의 요구들을 매칭 엔진 및/또는 폴러로부터 수신한다. In operation 221, the delivery server (s) receives at least one request to deliver the one or more messages to one or more users from the matching engine and / or polar. 요구들은 일반적으로 키들 및 각 키와 관련된 값들의 세트를 포함한다. Requirements typically include a set of values ​​associated with the keys, and each key. 키들은 이메일, 인스턴트 메신저, SMS, 웹 서버, 파일 전송 프로토콜(FTP) 전달 등과 같은 전달 방법에 대응하는 전달 템플릿들 내의 위치 보유자들(placeholders)에 대응한다. Keys correspond to e-mail, instant messaging, SMS, Web server, file transfer protocols placeholders within the template corresponding to the transfer delivery method, such as the (FTP) transfer (placeholders). 예를 들면, 요구 내의 <fullname, John Smith>의 키-값 쌍은 선택된 전달 템플릿 내의 'fullname' 위치 보유자를 대체하기 위해 사용될 것이다. For example, the <fullname, John Smith> in the requested key-value pair is used to replace the 'fullname' placeholder within the selected forwarding template. 전달 템플릿들은 개인 홈 페이지 하이퍼텍스트 프로세싱(PHP), JAVA TM 서버 페이지(JSP), HTML Force 2000(HF2K)과 같은 잘 알려진 템플릿 언어, 및/또는 사유 템플릿 언어(proprietary template language)로 작성될 수 있다. Forward template can be created as a personal home page hypertext processing (PHP), JAVA TM server pages (JSP), HTML Force 2000 ( HF2K) well-known template language, and / or proprietary template language (proprietary template language), such as . 주식 시세, 뉴스, 항목별 광고(classifieds) 등과 같은 콘텐츠 유형은 전달 서버가 어느 전달 템플릿 세트를 사용할지를 판정하는 데 이용될 수 있다. The type of content, such as stock quotes, news, classified ads (classifieds) can be used to determine whether the delivery server is used to deliver any set of templates. 각각의 콘텐츠 유형마다, HTML 페이지 서버, 텍스트 파일 전송, 인스턴트 메신저, SMS 등과 같은 서로 다른 이용 가능한 전달 메커니즘들에 대해 전달 템플릿 세트가 생성될 수 있다. For each type of content, there is a set of delivery templates can be created for different delivery mechanisms available, such as an HTML page server, text file transfer, instant messenger, SMS. 그러나, 전달 서버들은 일반적으로 처리될 특정 알림 문서에 대해 전혀 알지 못한다. However, the delivery server are not typically know nothing for certain documents to be treated as a notification. 대신에, 전달 서버들은 단순히 콘텐츠 및 사용자 ID 목록을 포함하는 문서를 볼 뿐이다. Instead, the server passes are just simply view documents that contain content and user ID list. 콘텐츠 문서 및 사용자 ID의 이러한 조합은 때때로 프로세스매치리스트(ProcessMatchList)로 불린다. This combination of content and document user ID is sometimes referred to as a process matching list (ProcessMatchList). 위에서 설명된 바와 같이, 사용자 ID 목록은 특정 콘텐츠 피드와 매칭한 사용자 ID들을 포함한다. As described above, the user ID list contains the specific content feed and matching the user ID. 콘텐츠 문서는 송신될 알림의 실제 콘텐츠를 나타내는 키-값 쌍들의 세트를 포함한다. It comprises a set of value pairs content document key for the actual contents of notification to be transmitted. 각 전달 방법에 대한 키-값 쌍들의 세트가 있을 수 있고, 이것들은 이메일 전달을 위한 한 쌍, 무선 전달을 위한 한 쌍, IM을 위한 한 쌍, 및 나중에 설명되는 웹 히스토리(web history)를 위한 한 쌍을 포함하지만, 이들에 제한되는 것은 아니다. Key for each delivery method - there may be a set of value pairs, it is one pair for mail delivery, one pair for wireless transmission, one pair for IM, and for web history (web history) described later a pair of, but not limited to these. 상기 표 1에서 식별된 키-값 쌍들 외에, ProcessMatchList는 또한 일반적으로 전달 목적으로 사용자의 프로파일로부터의 다음의 정보를 포함한다. The key is identified in the Table 1 in addition to the pairs of values, ProcessMatchList also typically include the following information from the user profile to the transfer object. - 예컨대 모바일 전달(mobile delivery)을 위해 필요할 수 있는 패스 스루 빌링 정보(pass through billing information). - for example, mobile transmission (pass through billing information) passes through the billing information that may be needed for (mobile delivery). 상기 정보는 또한 모바일 서비스 제공자, 이메일 제공자 등을 통한 전달 경로의 최종 레그(leg) 상에서의 임의의 빌링 활동(billing activity)을 위해, 알림 콘텐츠를 포맷팅하는 데 사용되는 실제 템플릿을 결정하기 위한, 로깅/통계 목적으로 사용될 수도 있다. The information is also to determine the actual template used to for any billing activity (billing activity) on the final leg (leg) of the transmission path through such mobile service providers, email providers, formatting the notification content, and logging / it may be used for statistical purposes. ProcessMatchList를 수신함과 동시에, 전달 서버는, 동작 222에서, ProcessMatchList에서 식별된 전달 방법 및/또는 각 사용자와 관련된 QOS 레벨을 판정한다. ProcessMatchList the same time as receiving, delivery server, at operation 222, determines the transmission method and / or QOS level associated with each user identified in the ProcessMatchList. 전달 서버는 인바운드 및 아웃바운드 큐 양쪽 모두에서 QOS 레벨에 따라서 요구들을 처리할 것이다. The delivery server will process the request in accordance with the QOS levels in both inbound and outbound queues. 매치 서버들로부터의 메시지는 일반적으로 결국에는 해당 큐가 포함하는 사용자들의 우선 순위 레벨에 따라서 적당한 인바운드 큐 내에 있게 된다. Message from the match server is usually eventually be within the appropriate inbound queue according to the priority level of the user, including the cue. 전달 서버로부터 발생된 알림은 일반적으로 결국에는 그 알림이 이메일, 무선 SMS, IM, 및/또는 등등의 것을 통하여 송신될 것인가에 따라서 적당한 아웃바운드 큐 내에 있게 된다. The notifications generated from the distribution server is generally in the end are within appropriate outbound queue, depending on whether the notification is to be transmitted to the e-mail, wireless SMS, IM, and / or so on. 추가적으로, 또는 대안적으로, 전달 서버들은 예를 들어 사용자 데이터베이스가 다운되어 있으면 프리미엄 사용자들이 특별한 전달 옵션들을 갖도록 할 수 있다. Additionally, or alternatively, it delivered servers, for example, if your database is down to Premium users have the special delivery options. 저장 서버들은 마지막 알려진 이메일 주소, 무선 장치 번호, 및/또는 각 사용자에 관해 알려져 있는 등등의 것을 저장한다. The storage server are stored so that the known about the e-mail address, the radio unit number, and / or each user's last known. 전달 서버가 사용자 데이터베이스로부터 정보를 얻을 수 없는 경우에 전달 서버는 저장 서버로부터 해당 정보를 검색한다. Dispatched when the server is unable to obtain information from the user database to the delivery server retrieves the information from the storage server. 전달 서버는 또한 알림마다, 무선 장치마다, 사용자마다, 및/또는 등등의 것마다 메시지 제한을 시행할 수 있다. The delivery server can also be performed for each notification, each wireless device, per-user, and / or so every message will be limited. 전달 서버는 메시지 제한 정보를 저장/검색하기 위해 저장 서버와 인터페이스할 것이다. The delivery server will interface with the storage server to store / retrieve messages limited information. 동작 224에서, 전달 서버는 소정의 사용자들에 대한 및/또는 소정의 전달 방법들을 통한 알림의 전달에 대해 임의의 종류의 차단(block) 또는 경로 변경(rerouting)이 행해져 있는지 여부를 판정한다. In operation 224, the distribution server determines whether there is any type of block for transmission of the notification through the and / or a predetermined delivery method, for a given user (block) or to change the path (rerouting) performed. 예를 들어, 사용자는 야간 시간(evening hours) 동안과 같이, 사용자가 어떠한 알림도 수신하고 싶지 않은 조용한 시간(quiet time)을 표시했을 수 있다. For example, the user may have shown a night time (evening hours), such as during a quiet time (quiet time) the user has no wish to receive notification Fig. 유사하게, 사용자가 휴가 중이어서, 사용자가 돌아올 때까지 아무런 알림도 전달되지 않도록 요구하였을 수 있다. Similarly, let the user is on vacation and can hayeoteul requires that until you come back not delivered any notification. 전달 서버는 또한 사용자가 주로 선호하는 방법 외에 임의의 수의 전달 방법들을 통하여 알림이 전송되어야 하는지 여부를 판정할 수 있다. Distribution server may also determine whether or not the user mainly through the delivery of any number of the preferred method of addition to the method of notification is to be sent. 판정 동작 226에서, 전달 서버는 어느 알림이 즉시 전달되어야 할지 및 어느 알림이 스케줄된 시간에 송신되어야 할지를 판정한다. At decision operation 226, the delivery server determines whether any notification should be delivered immediately, and this whether or not any notification to be sent at the scheduled time. 나중의 전달을 위해 스케줄되어 있는 알림들은 전달 저장 서버들 상에 저장될 것이다. Notifications that are scheduled for delivery later will be stored on the storage server transfer. 전달 저장 서버들을 구현하는 적어도 2가지 방법이 있는데, 여기서는 옵션 A와 옵션 B로 불린다. There are at least two ways to implement the delivery server stores, in which called the Option A and Option B. 스케줄된 알림들에 대해, 자원 관리자 서버(RMS)는, 동작 228에서, 어느 사용자의 알림들이 어느 저장 서버들에 저장되는지를 판정한다. For the scheduled notification, the server resource manager (RMS) determines, if at operation 228, which stores the user of the notification to the one storage server. 한 사용자에 대한 알림을 저장할 필요가 있는 임의의 전달 서버는 먼저 사용자 데이터베이스 내의 그 사용자의 대응하는 알림 설정들을 검색(lookup)하여 알림들이 저장될 저장 서버 ID(StorageID)의 위치를 알아낼 것이다. Random distribution server which need to store notifications for a user would first set the corresponding notification to the user in the user database to search (lookup) to find out the location of the notification to the storage server ID (StorageID) to be stored. 만일 그러한 저장 서버 ID가 존재하지 않는다면, 전달 서버는 RMS와 연락하여 저장 서버 ID를 얻는다. If the ID does not exist such a storage server, delivery server, contact the RMS server to obtain the stored ID. RMS는 등록된 저장 서버들 각각의 현재의 부하/이용도(load/usage)에 따라서, 사용자의 알림들이 저장될 저장 서버가 어느 것인지를 판정할 것이다. RMS will be determined whether the user of the notification to the storage server to be stored either according to the load / utilization of the registered servers each storing currently (load / usage). 서버 ID(serverID)가 전달 서버에 반환될 것이고, 전달 서버는 그 후 사용자 데이터베이스 내의 알림 설정들 내에 저장 서버 ID를 저장할 것이다. Will be server ID (serverID) is returned to the delivery server, the delivery server will store the server ID stored in the notification settings in the database and then users. 장애극복(failover) 목적으로, 또는 RMS가 다운되어 있거나 응답하지 않을 경우, RMS API는 그 RMS에의 임의의 후속 쿼리 시에, 그것이 다시 나타날 때까지, 최종 발행된 저장 서버 ID가 결과로서 전달되도록 할 것이다. If failover (failover), or RMS is down or not responding purpose, RMS API is to be delivered at the time of any subsequent queries by its RMS, until it reappears, the final storage server ID issued as a result will be. 일단 적당한 저장 서버가 식별되면, 전달 서버는, 동작 230에서, 사용자의 알림(들), 및 (선택 사양으로) 그들의 전달 옵션들을 해당 저장 서버에 저장한다. Once a suitable storage server is identified, the delivery server, at operation 230, stores them in the user notification delivery option (s), and (optionally) to the storage server. 단순히 나중의 전달을 기다리는 것 외에, 저장된 알림들은 보다 새로운 알림들과 비교되어 가장 최근의 콘텐츠를 보증할 수 있다. In addition to simply wait for the delivery of the latter, the notification can be saved than is compared with the new alerts to guarantee the most recent content. 예를 들면, 사용자는, 비록 스케줄된 전달 시간 전에 어느 기간의 시간에 걸쳐서 그 업데이트들로부터 다수의 매치들이 발생될 수도 있지만, 하루에 여러 번 업데이트된 뉴스 기사에 대해 단 하나의 알림만을 수신해야 한다. For example, a user may be, though the scheduled delivery time before over time in any period may be multiple matches are generated from its update, but should receive only one notification for multiple updated news articles a day . 전달 서버들에서와 같이, 저장 서버들은 일반적으로 임의의 알림 특정 정보에 대해 전혀 알지 못할 것이다. As in the delivery server, storage server typically would not know anything about any of the specific information in the notification. 저장 서버들은 고속 검색을 위해 공유 메모리(예컨대, shm)에 정보를 저장하고, 가능한 한 거의 디스크 저장을 사용하지 않으려고 모든 시도를 행할 것이다. Storage servers and stores the information in a shared memory (for example, shm) for high-speed search, and you do not want to use a little disk storage available to perform all attempts. 효율성을 위하여, 콘텐츠 피드 정보와 같이, 다수의 사용자들에게 공통인 임의의 정보는 한 번 저장되고 그 사용자들에게 인덱싱될 수 있다. For efficiency, such as content feed information, common to any information to multiple users may be stored once and indexed to the user. 일 실시예에서, 공유 메모리 및 디스크 라이트 백(disk write back)의 조합을 통하여 구현될 수 있는, 각 서버에 적어도 4개의 저장 영역들이 있을 수 있다. In one embodiment, there may be at least four storage areas in each server, which may be implemented through a combination of shared memory, and disk write back (disk write back). - 피드 저장소(Feed storage): 키-값 쌍들의 각 컬렉션은 콘텐츠 피드의 유형에 매칭되는 사용자들의 전체 세트에 대해 한 번 저장될 것이다. - Feed Store (Feed storage): key-value pairs of each collection will be stored once for the entire set of users that match the type of content feeds. - 사용자 저장소(User storage): 스케줄된 알림을 수신하는 것에 관심이 있는 각 사용자에 대한 엔트리. - User Repository (User storage): The entry for each user in interested in receiving the notification schedule. 이 영역은 사용자들이 알림을 삭제/편집하려고 하는 경우에 사용자의 레코드에의 고속 액세스를 위해 필요하다. This area is needed for high-speed access to your records if you are trying to delete / edit notifications. - 시간 저장소(Time storage): 스케줄된 알림을 수신하는 것에 관심이 있는 각 사용자는 적당한 시간 슬롯 및 적당한 서비스 큐 하에 저장된 레코드를 가질 것이다. - Storage time (Time storage): Each user is interested in receiving the notification schedule will have the records stored under appropriate time slots and appropriate service queue. - 웹 저장소(Web Storage): 모든 전달된 알림은, 웹 프런트 엔드(web front end) 상에서의 이용을 위해, 그것을 생성한 피드에의 포인터를 갖는 영구 레코드(permanent record)를 가질 것이다. Web Store (Web Storage): All notifications are delivered, will have a web front-end permanent record (permanent record) for use on the (web front end), with a pointer to that generated it feeds. 장애극복 및 스케줄된 알림들의 보다 빠른 검색을 위해, 서버들 중 임의의 것이 미러링될 수 있다. For faster retrieval of failover and scheduled reminders, it can be any of servers can be mirrored. 각각의 서버는, 예컨대 모듈로 알고리즘(modulo algorithm)을 통하여, 알림들의 서브세트에 대해 작용할 수 있다. Each server, for example via a modulo algorithm (modulo algorithm), can act on the notification of the sub-set. 스케줄된 알림을 전달하는 것과 같은, 각 동작(action)마다, 서버는 그 동작을 하나 이상의 피어 미러들(peer mirrors)에게 복제할 수 있다. Each, each action (action), such as to deliver a schedule notification, the server may be replicated to the one or more peer mirrors the operation (peer mirrors). 스케줄된 전달들을 수행하는 프로세스들 간에 하트비트 메커니즘(heartbeat mechanism)이 일반적으로 설정되고, 그에 따라서 만일 서버가 다운되거나 또는 어떤 이유로 프로세스에 장애가 생기면, 미러 서버들 상의 남아 있는 프로세스들이 계속해서 그 작업을 행할 것이다. 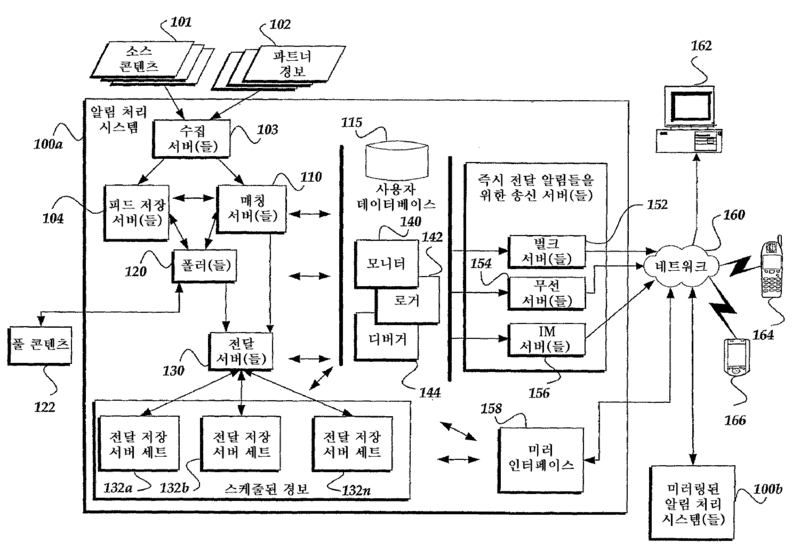 The heartbeat mechanism (heartbeat mechanism) between that perform the scheduled transmission process, and are generally set to, accordingly If the server is down, or for some reason saenggimyeon failure in process, a process that remains on the mirror to continue the work It will do. 이것은 장애극복을 위해서만이 아니라, 이용 가능한 처리 능력을 배가(예를 들면, 2배, 3배 등)하기 위해서도, 미러 서버들을 이용한다. This is also for the, available processing capability, not only for fail-over times (e.g., twice, three times, etc. ), use of the mirror. 전달 저장 서버의 대안 실시예에서, 관계 데이터베이스(relational database)가 알림 매칭 결과들에 관련하여 피드 콘텐츠를 저장한다. In an alternate embodiment of a delivery server stores, in conjunction with the notification match to a relational database (relational database) and stores the feed content. 개념적으로, 3가지 유형의 표가 피드 콘텐츠, 사용자 알림 매치들, 및 전달 스케줄 시간들을 관련시키기 위해 사용된다. Conceptually, the three types of tables are used to associate the feed content, the user notification Matches, and delivery schedule time. 따라서, 그 3가지 유형의 표는 피드 표(Feed table), 알림 매치 표(AlterMatches table), 시간 슬롯 표(TimeSlot table)로 불린다. Thus, the three types of tables is referred to as the feed table (Feed table), notification matching table (AlterMatches table), a time slot table (TimeSlot table). 피드 표는 저장 서버에 의해 수신되는 각 콘텐츠 피드를 포함한다. Feed table includes each content feed received by the storage server. 각 콘텐츠 피드는 피드 Id(FeedId)에 의해 고유하게 식별된다. Each content feed is uniquely identified by a feed Id (FeedId). 샘플 피드 표 데이터 구조가 표 2에 도시되어 있다. The sample feed table data structure is shown in Table 2. 알림 매치 표는 모든 알림에 대한 사용자 매치들을 저장한다. Notifications match table stores the user match for all notifications. 사용자의 알림은 고유한 알림 Id(AlertId)에 의해 참조된다. Of user notification is referred to by a unique alert Id (AlertId). 각 알림 Id마다 0 또는 그 이상의 피드가 있을 수 있다. Each notification Id can have zero or more feed. 하나의 알림 Id에 대한 몇몇 매치들은 알림 매치 표 내의 다수의 행에 의해 표현될 것이고, 각 행은 상이한 피드 Id를 갖는다. Several matches to one notification Id they will be represented by a number of rows in the notification matches the table, each row has a different feed Id. 각 투플(tupel) <알림 Id, 피드 Id>는 알림 매치 표 내에서 고유하고 한 사용자의 알림을 대응하는 콘텐츠 피드에 결합시킨다. Each tuple (tupel) <notification Id, feed Id> notification combines the content feed that is unique within the table correspond to the match in the user notification. 샘플 알림 매치 표 데이터 구조가 표 3에 도시되어 있다. The sample notification match table data structure is shown in Table 3. 시간 슬롯 표는 전달 시간 슬롯과 관련된 모든 사용자들의 알림 id들을 저장한다. Time slot table stores the notification id for all users associated with the passing of time slots. 하루 동안의 각 15분 전달 시간 슬롯이 하나의 시간 슬롯 표에 대응한다. Each 15 minutes transmission time slots for one day corresponds to one time slot of the table. 예를 들어, 표 TimeSlot_9_45는 오전 9:45에 설정된 전달 선호(delivery preferences)를 갖는 모든 알림 id들을 포함한다. For example, Table TimeSlot_9_45 includes all notification id having a transfer preferences (delivery preferences) is set to 9:45 a.m.. 각 전달 슬롯의 시작에서, 다수의 프로세스들이 시간 슬롯 표 내의 알림 id들을 처리하기 시작한다. At the start of each transmission slot, the number of processes to start the processing of the alert id in time slot table. 이들 프로세스들을 조정(coordinate)하기 위해, 시간 슬롯 표 내의 'ClaimedBy' 필드는 각 프로세스가 또 다른 프로세스가 특정 알림 id에 대해 이미 작업하고 있는지 여부를 체크할 수 있게 한다. To coordinate (coordinate) these processes, 'ClaimedBy' field in the time slot table allows you to check whether you are already working for each process is yet another process-specific notification id. 만일 ClaimedBy 필드가 비어 있으면, 이 알림 id는 다음의 이용 가능한 프로세스에 의해 처리될 수 있게 된다. If there is ClaimedBy field is empty, the alert id is able to be processed by the next available of the process. 샘플 시간 슬롯 표 데이터 구조가 표 4에 도시되어 있다. The sample time slot table data structure is shown in Table 4. 알림들이 저장소 내에 있는 동안, 알림 저장 서버는 또한, 동작 232에서, 사용자 데이터베이스로부터 업데이트들을 얻을 것이다. Notifications are while in storage, notification storage server also will get an update from them in operation 232, a user database. 이에 대한 한 가지 이유는 사용자가 알림을 삭제할 때마다 또는 사용자가 스케줄된 알림의 전달 시간을 변경하려고 할 때마다 사용자 엔트리들을 제거하기 위함이다. One reason for this is intended to remove the entry for each user when the user tries to change the delivery time for each user or schedule reminders when deleting notifications. 매 1시간마다와 같이, 미리 정해진 전달 주기로, 저장 서버들은 그 주기로 전달될 저장된 알림들을 액세스하여, 즉시 전달을 위해 그들 저장된 알림들을 표시(mark)한다. Cycle, a predetermined transfer, such as every hour, by accessing the storage server are stored in the notification to be delivered a cycle that will be displayed (mark) the notifications they are stored for immediate delivery. 그 후 저장 서버들은 동작 234에서 그들 표시된 알림들을 전달 서버들에 송신한다. After storage server it is sent to the delivery server, the notification shown in their operation 234. 동작 236에서, 전달 서버들은 발신되는 알림들을 미리 선택된 전달 방법에 따라서 포맷팅하기 위한 템플릿이 이전에 적용되지 않았다면, 그 템플릿을 적용한다. In operation 236, the delivery server can not been previously applied to the template is formatted according to a pre-selected delivery method, the notification originated, and applies the template. 그 후 전달 서버들은 이메일, 인스턴트 메시지, SMS, 및/또는 어느 전달 방법(들)이든 각 알림과 관련되어 있는 방법을 통해 전달하기 위해 즉시 전달 알림들(immediate delivery alerts)을 송신 서버들에 통신한다. After the delivery server can then communicate to the e-mail, instant message, SMS, and / or any delivery method (s) or their immediate delivery notifications for delivery via a method that is associated with each notification (immediate delivery alerts) the sending server . 일단 전달 서버에 의해 알림이 송출되면, 동작 238에서, "addToHistory" 요구가 저장 서버들에 송신되어, 알림이 송출된 사실로 사용자의 히스토리를 업데이트하게 된다. Once the notification is sent by the delivery server, at operation 238, it is sent to the "addToHistory" Asking storage server, the notification to the update history of the user to the transmission case. "addToHistory" 요구 역시 키-값 쌍들의 세트를 포함하고, 따라서 상이한 알림 유형들이 상이한 정보 세트들을 저장할 수 있다. "AddToHistory" request also key-may store include a set of value pairs, and thus different types of notifications to a different set of information. 여기서도, 전달 서버는 일반적으로 그것이 "addToHistory" 요구를 송신하고 있는 해당 특정 알림에 대해 전혀 알지 못한다. Again, the delivery server usually it does not know at all for that particular notification and sends a "addToHistory" requirements. 저장될 필요가 있는 키-값 쌍들의 세트는 매칭 측에 의해 정의된다. Key that needs to be stored - a set of value pairs is defined by the matching side. 전달 서버로의 모든 요구는 또한 그 특정 알림에 대해 저장될 필요가 있는 키 명칭들의 임의의 세트를 동반해야 한다. All requirements of the delivery server must also be accompanied by any of a set of key names that need to be stored for that particular notification. 히스토리 정보는 또한 저장 서버들로부터 다른 서비스들로 브로드캐스트될 수 있다. Historical information may also be broadcast from the storage server to the other services. 예를 들어, 히스토리 결과들은, 미러링된 저장 서버 세트로부터 직접, 또는 히스토리 결과들을 공급하는 별개의 저장 서버 세트로부터, 프런트 엔드 웹 페이지들 및/또는 다른 웹 포털 페이지들에 공급될 수 있다. For example, the historical results, from the mirrored set of storage servers may be fed directly to, or distinct from the stored set of servers, the front-end Web page and / or other web portal page for supplying the historical results. 공유 메모리는 가능한 한 많은 사용자들의 히스토리 결과들을 보유할 수 있고("addToHistory" 요구들이 전달 서버들로부터 들어올 때 라이브로 업데이트됨(updated live)), 그와 동시에 히스토리 결과들은 영구 저장을 위해 디스크에 기입될 수 있다. Shared memory is a large number of users can retain their historical results and ( "addToHistory" needs to search the live updates as they came from the delivery server (updated live)), and at the same time the historical results available are written to disk for permanent storage It can be. 만일 사용자의 상위 N개 히스토리 결과들이 공유 메모리에 있지 않다면, 그 히스토리 결과들은 사용자의 영구 저장 파일로부터 액세스될 수 있다. Ten thousand and one top N results history of the users are not in the shared memory, the historical results can be accessed by a user of the persistent storage file. 위에서 지적된 바와 같이, 결과들은 키-값 쌍들로 반환될 것이고, 그 결과들을 수신 측에게 적당한 방식으로 포맷팅하는 것은 수신 측에 맡겨질 것이다. As noted above, the results are the key-value pairs will be returned to, and as a result is that the formatting in a suitable manner to the receiving side will be left to the receiving side. 예를 들어, 실제 뉴스 알림은 사용자가 수신한 마지막 3개의 뉴스 알림의 요약 및 URL과 함께 사용자에 송신되었을 수 있는 데 반해, 히스토리 페이지는 단지 URL을 제시하기만 하면 될 것이다. For example, whereas the actual news alerts that a user may have been sent to the user with the last three news summary and URL of a notification received, the history page will just be simply to present the URL. 독립적인 포맷팅은 히스토리 파일들 내에 저장되어 있는 것을 변경하지 않고 새로운 알림 유형들이 추가될 수 있게 함으로써, 히스토리 보고를 위한 새로운 요건들을 가진 새로운 알림 유형을 수용한다. Independent formatting by making a new type of notification can be added without having to change what is stored in the history file, it receives a new alert types with the new requirements for historical reporting. 일반적으로, 키-값 접근법은 장래의 요구에 적합할 것이다. In general, the key-value approach will be suitable for future needs. 파국적 고장(catastrophic failure), 손상 문제, 또는 심지어 서버들을 업데이트할 필요가 있는 경우에 정보가 손실되지 않도록 하기 위해 다수의 조치들이 이용된다. If a catastrophic failure that needs to update the (catastrophic failure), corruption, or even a server, a number of measures are used to ensure that the information is not lost on. 위에서 지적된 바와 같이, 각 저장 서버는 적어도 하나의 다른 서버에 의해 미러링되고, 따라서 서버는 그것의 미러(들)가 트래픽을 핸들링하는 동안 다운될 수 있다. As indicated as above, each storage server being mirrored by at least one other server, so the server has its mirror (s) can be down while handling the traffic. 공유 메모리 및 복제 파일들의 백업들이 이용될 수 있다. Shared memory, and can make backups of the replicated files may be used. 예를 들어, 매일 적어도 두 번의 공유 메모리의 백업이 이용될 수 있고, 또한 적어도 24시간만큼의 착신되는 복제 볼륨 파일들은, 가능한 한 빠르게 공유 메모리의 복제를 가능케 하여 서버를 다시 온라인으로 복귀시킨다. For example, there is a backup of at least two shared memory can be used every day, and also returns the server to enable that incoming files are replicated volumes, the rapid replication of shared memory available for at least 24 hours as back online. 다른 복구 능력들은 전달 요구들의 완벽한 처리를 보증한다. Other recovery capabilities should ensure a complete processing of transfer requirements. 이를테면, 대응하는 콘텐츠 문서와 관련된 모든 사용자 ID들이 처리되었을 때만 전달 서버는 알림을 "완료"(done)로 표시할 수 있다. For example, only when all the corresponding user ID associated with the content distribution server document to be processed may be displayed in the "complete" (done) notification. 모니터 및/또는 다른 유틸리티들이 미송신된 알림들의 상태를 모니터하고 필요할 경우 알림 처리를 반복시킬 수 있다. If the monitor and / or other utilities are required to monitor the state of the US sending notifications can repeat the notification process. 이 복구 능력은 또한 송신 서브들에 적용될 수 있다. This resilience is also applicable to transmission sub. 복구를 보증하는 것 외에, 미러 세트들은 범위성(scalability)을 위해 사용될 수 있다. In addition to the warranty, repair, mirror sets can be used for scalability (scalability). 매치 서버들로부터의 증가된 트래픽을 핸들링하기 위해, 언제든지 임의의 개수의 추가적인 전달 서버들이 추가될 수 있다. To handle the increased traffic from the matching server, and can be added at any time to any number of additional delivery server. 반대로, 임의의 유지 보수 이유로 언제든지 임의의 전달 서버가 오프라인으로 될 수 있다. Conversely, whenever any transfer of any two euros server maintenance can be offline. 남아 있는 활성 상태의 서버들(live servers)이 매치 서버들로부터의 착신되는 트래픽을 핸들링할 것이다. Of the remaining active in the server (live servers) it will handle the incoming traffic from the matching server. 증가된 사용자 등록을 핸들링하기 위해, 임의의 개수의 저장 서버들이 수평적으로 추가될 수 있고, 이 경우 보다 많은 전체 미러 세트들이 추가된다. To handle the increased user registration, any number of storage servers can be added to the horizontal, it is more than many mirror set in this case. 증가된 스케줄된 알림 활동을 핸들링하기 위해, 저장 서버들은 또한 수직적으로 추가될 수 있고, 이 경우 보다 많은 미러 서버들이 세트마다 추가된다. To handle the increased activity schedule notification, the storage server are also added may be added to the vertical, than the number of the mirror in this case are each set. 도 7은 본 발명의 일 실시예에 따른, 모범적인 서버(300)의 기능 블록도를 도시한다. Figure 7 illustrates a functional block diagram of an exemplary server 300 in accordance with one embodiment of the present invention. 서버(300)는 매칭 서버, 피드 저장 서버, 폴러, 전달 서버, 저장 서버, 송신 서버 등과 같은, 위에서 논의된 서버들 중 어느 하나 이상의 서버를 포함할 수 있다. The server 300 may include any one or more servers of the same, a server as discussed above, the matching server, feed storage server, Poller, distribution server, storage server, transmitting the server. 클라이언트 장치들(client devices)은 유사하게 구성될 수 있다. Client devices (client devices) may be similarly configured. 서버(300)는 도시된 것들보다 더 많은 컴포넌트들을 포함할 수 있다. Server 300 may include many more components than those shown. 그러나, 도시된 컴포넌트들은 본 발명을 실시하기 위한 예시적 실시예를 개시하기에 충분하다. However, the components shown are sufficient to disclose an illustrative embodiment for practicing the invention. 서버(300)는 처리 장치(processing unit)(312), 비디오 디스플레이 어댑터(314), 대용량 메모리(mass memory)를 포함하고, 이들 모두는 버스(322)를 통하여 서로 통신한다. Server 300, and all of them include a processing unit (processing unit) (312), video display adapter 314, a large-capacity memory (mass memory) is in communication with each other via a bus 322. The 대용량 메모리는 일반적으로 RAM(316), ROM(332), 및 광 드라이브(326), 하드 디스크 드라이브(328), 테이프 드라이브, 및/또는 플로피 디스크 드라이브와 같은, 하나 이상의 영구 대용량 저장 장치들을 포함한다. The mass memory generally includes RAM (316), ROM (332), and an optical drive 326, a hard disk drive 328, for example, a tape drive, and / or floppy disk drive, one or more permanent mass storage devices, . 대용량 메모리는 서버(300)의 동작을 제어하기 위한 운영 체제(320)를 저장한다. Mass memory stores operating system 320 for controlling the operation of the server 300. 임의의 범용 운영 체제가 이용될 수 있다. There is any general-purpose operating system may be used. 서버(300)의 저레벨 동작을 제어하기 위한 기본 입출력 시스템("BIOS")(318)이 또한 제공된다. Basic Input Output System ( "BIOS") (318) for controlling low-level operation of server 300 is also provided. 도 6에 예시된 바와 같이, 서버(300)는, 네트워크 인터페이스 장치(310)를 통하여, 인터넷, 또는 도 1의 네트워크(160)와 같은 어떤 다른 통신 네트워크와 통신할 수 있고, 상기 네트워크 인터페이스 장치(310)는 전송 제어 프로토콜/인터넷 프로토콜(TCP/IP)을 포함한 다양한 통신 프로토콜과 함께 사용되도록 구성되어 있다. As it illustrated in Figure 6, the server 300 through a network interface device 310, can communicate with any other communication network such as the Internet, or network 160 of Figure 1, the network interface device ( 310) is configured for use with various communication protocols, including transmission control protocol / Internet protocol (TCP / IP). 네트워크 인터페이스 장치(310)는 때때로 송수신기, 송수신 장치, 네트워크 인터페이스 카드(NIC) 등으로 알려져 있다. Network interface device 310 is sometimes known as a transceiver, a transceiver, network interface card (NIC) and the like. 서버(300)는 또한 마우스, 키보드, 스캐너, 또는 도 1에 도시되지 않은 다른 입력 장치들과 같은 외부 장치들과 통신하기 위한 입출력 인터페이스(324)를 포함한다. The server 300 also includes an output interface 324 for communicating with external devices, such as other input devices not shown in the mouse, keyboard, scanner, or FIG. 위에서 설명된 대용량 메모리는 컴퓨터 판독 가능 매체, 즉 컴퓨터 저장 매체의 또 다른 유형을 예시한다. The mass memory as described above illustrates another type of computer-readable media, namely computer storage media. 컴퓨터 저장 매체는, 컴퓨터 판독 가능 명령, 데이터 구조, 프로그램 모듈, 또는 다른 데이터와 같은, 정보의 저장을 위해 임의의 방법 또는 기술로 구현된 휘발성, 비휘발성, 탈착식(removable), 및 고정식(non-removable) 매체를 포함할 수 있다. Computer storage media, computer-readable instructions, data structures, program modules, or volatile, nonvolatile, removable (removable) implemented in any method or technology for storage of information, such as other data, and a fixed (non- removable) may include a medium. 컴퓨터 저장 매체의 예로는 RAM, ROM, EEPROM, 플래시 메모리, 또는 다른 메모리 기술, CD-ROM, 디지털 다용도 디스크(DVD), 또는 다른 광학 저장 장치, 자기 카세트, 자기 테이프, 자기 디스크 저장 장치, 또는 다른 자기 저장 장치들, 또는 원하는 정보를 저장하는 데 사용될 수 있고 컴퓨팅 장치에 의해 액세스될 수 있는 임의의 다른 매체를 포함한다. Examples of computer storage media, RAM, ROM, EEPROM, flash memory or other memory technology, CD-ROM, digital versatile disk (DVD), or other optical storage, magnetic cassettes, magnetic tape, magnetic disk storage, or other It can be used to store the magnetic storage device, or the desired information and includes any other media that can be accessed by a computing device. 대용량 메모리는 또한 프로그램 코드 및 데이터를 저장한다. Mass memory also stores program code and data. 하나 이상의 애플리케이션들(350)이 대용량 메모리 내에 로드되어 운영 체제(320) 상에서 실행된다. One or more applications 350 are loaded into mass memory and run on operating system 320. The 애플리케이션 프로그램들의 예로는 데이터베이스 프로그램, 스케줄러(schedulers), 트랜스코더(transcoders), 이메일 프로그램, 캘린더, 웹 서비스, 워드 프로세싱 프로그램, 스프레드시트 프로그램 등을 포함한다. Examples of application programs include programs such as databases, schedulers (schedulers), Transcoder (transcoders), e-mail programs, calendar, web services, word processing programs, spreadsheet programs. 대용량 저장 장치는 수집 처리 모듈(172), 관리 인터페이스(174), 매칭 엔진(110a), 폴러(120a), 전달 인터페이스(130a) 등을 더 포함할 수 있다. A mass storage device may further include an acquisition processing module 172, a management interface 174, a matching engine (110a), the poller (120a), passing interface (130a) and the like. 상기 명세서, 예들, 및 데이터는 본 발명의 구성의 제조 및 이용에 대한 완전한 설명을 제공한다. The above specification, examples, and data provide a complete description of the manufacture and use of the composition of the invention. 본 발명의 사상 및 범위를 벗어나지 않고서 본 발명의 다수의 실시예들이 행해질 수 있으므로, 본 발명은 이하에 첨부된 청구항들에 귀속된다. It may be made a number of embodiments of the present without departing from the spirit and scope of the invention, the present invention is attributable to the claims appended below. 중 적어도 하나를 포함하는 방법. Of the methods that comprise at least one. 중 적어도 하나를 더 포함하는 방법. Of the method further comprises at least one. 제1항에 있어서, 상기 콘텐츠를 정규화하는 단계는, 상기 복수의 포맷 중 어느 하나로부터 정규화된 포맷으로 상기 콘텐츠를 변환하는 것을 포함하는 방법. The method of claim 1, further comprising normalizing the content, the method comprising converting the content to a normalized format from any of the plurality of formats. 을 포함하는 방법. How to include. 제5항에 있어서, 상기 쿼리 표현식은 상기 적어도 하나의 사용자의 사용자 프로파일(user profile)로부터 액세스되는 방법. The method of claim 5, wherein the query expression methods to be accessed from the (user profile) the at least one user in the user profile. 중 적어도 하나인 방법. At least one of the ways. 중 하나를 포함하는 방법. Of methods, including this one. 중 적어도 하나로서 상기 알림 메시지를 전달하는 것을 포함하는 방법. As at least one of which comprises the transmission notification message. 제1항에 있어서, 정규화하고, 관련시키고, 발생시키고, 가능케 하는 상기 동작들을 미러링(mirroring)하는 단계를 더 포함하는 방법. The method of claim 1, wherein the normalization, and method according to, and generates, comprising the step of mirroring (mirroring) of the operation that allows more. 중 적어도 하나를 포함하는 시스템. System comprising at least one of. 중 적어도 하나의 동작을 수행하게 하는 시스템. System of which at least perform one action. 상기 콘텐츠의 상기 적어도 하나의 부분이 상기 쿼리 표현식과 매칭하면, 상기 콘텐츠의 상기 적어도 하나의 부분과 상기 적어도 하나의 사용자 간의 관련을 설정하는 동작을 수행하게 하는 시스템. A system that the at least one portion of the content if the operation of the query matches the expression, setting the associated at least one between the portion and the at least one user of the content. 동작들을 수행하게 하는 시스템. System that performs the operation. 상기 적어도 하나의 사용자에게 상기 알림 메시지를 미리 정해진 시간에 전달하는 동작을 수행하게 하는 시스템. System to perform the at least one user the operation of the notification pass the message to a predetermined time. 제12항에 있어서, 상기 알림 메시지를 수신하기 위한 모바일 클라이언트 장치(mobile client device)를 더 포함하는 시스템. The method of claim 12, wherein the notification mobile client device for receiving a message (mobile client device) the system further comprising. 중 적어도 하나를 포함하는, 컴퓨터 판독가능 매체. At least one computer-readable medium comprising of. 중 적어도 하나를 포함하는, 메시지를 제공하기 위한 시스템. At least one system for providing a message including one.